A forerunner conference to the SCIAC was the Intercollegiate Football Association of Southern California, which existed in the 1890s. It included Occidental, Caltech (then called Throop Polytechnic), USC, Chaffey College and Los Angeles High School. The SCIAC was founded in 1915 with five member schools with the goals to promote amateurism in athletics. The five founding members, all of whom are still members, are California Institute of Technology, Occidental College, Pomona College, the University of Redlands, and Whittier College. Although all five original charter members are still affiliated with the SCIAC, only two, Occidental and Redlands, have had uninterrupted membership. The acronym SCIAC (standing for Southern California Interscholastic Athletic Council) was in use during 1913 and 1914 until that organization became the CIF Southern Section. On May 12, 2011, the SCIAC announced that Chapman University would become the ninth member, beginning with the 2011–12 academic year. The addition of Chapman marks the first expansion of the conference since California Lutheran University joined in 1991. At one time, most of the colleges were the Southern California affiliates of various Christian sects such as the Quakers and the Presbyterians. Today, only California Lutheran University maintains an affiliation with a church. 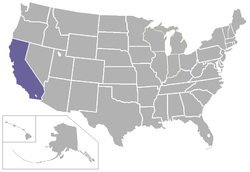 There are three former members of the SCIAC: University of California, Los Angeles, San Diego State University and University of California, Santa Barbara. All former members now compete in NCAA Division I athletics. ^ "Chapman University Welcomed as the Ninth Member of the SCIAC". Retrieved 2011-07-23. ^ a b "History of SCIAC". Retrieved 2007-12-02.